Abstract: This paper evaluates the importance of trade in goods when modelling demand for tourism. It is argued that the limited literature testing causality between trade in goods and tourism does not consider the appropriate variables. This study utilises bilateral data for 16 UK tourist destinations in order to test for Granger causality between trade in goods and tourism expenditure. UK imports, exports and total trade are tested separately, whilst controlling for real GDP and real bilateral exchange rates. The novelty of this paper is the variable specification, as well as testing the causal relationship for the case of UK outgoing tourists. Our findings suggest a causal relationship between the tourism expenditure of UK residents and trade in goods. These results support the inclusion of a trade-in-goods variable when estimating tourism demand, as well as adopting appropriate methodologies to account for this causal relationship. Furthermore, there is strong evidence that the trade-tourism link is important for both the UK and host countries. Abstract: We employ an Exponential Generalised Autoregressive Conditional Heteroskedasticity (EGARCH) model to examine the volatility spillover effects between stock prices and exchange rates in three developed and three emerging countries, across the recent pre-financial-crisis, crisis and post-crisis periods. The evidence indicates asymmetric volatility spillover effects between stock prices and exchange rates in both developed and emerging economies during the financial crisis. The findings of the significant volatility spillover effects between exchange rates and stock prices imply that the markets are informationally inefficient, and one market has significant predictive power on the other. Abstract: Although better information about the dynamics of the yields on financial assets is decisive for both borrowers and lenders alike, it is not uncommon for researchers to employ standard unit-root tests to determine the extent of the persistence and, based on such results, treat the entire series as either stationary or non-stationary. In this paper, using weekly data of yields in four international markets — Canada, the UK, the US and the euro area — from March 1997 to October 2013, and employing an approach which allows us to identify regime switches between periods of I(0) versus I(1) behaviour, we provide empirical evidence for the realistic possibility that yields may, in fact, have changing persistence over time. Our results identify and compare, for each market and several maturities, the time variation properties in the dynamics of the yield curves. Some economic implications of our results are discussed. Abstract: This study examines the impact of new immigration on housing rent, using Canadian province-level panel data from 1983 to 2010. In its estimations, it utilises econometric methods such as panel unit roots, panel co-integration regressions and panel vector error correction models. Both fully-modified ordinary least squares and dynamic ordinary least squares models suggest that immigration flow has a significant positive impact on housing rent in the long run. The panel vector error correction model analysis suggests both short run and long run causal impacts of new immigration on rent. Abstract: As a depletable resource, oil is a useful source of economic growth, but may not be relied upon for long-term sustainable development. Diversification from oil is needed to achieve this. 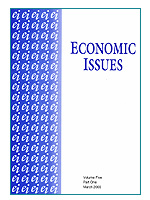 This paper examines the most important non-oil determinants of growth in the Saudi economy between 1970 and 2011, using the Johansen approach and error correction modelling, to study the relationship between all variables, both long and short-run. It focuses on the role of non-oil sectors, given the government's determination to reduce dependence on oil income. The study uses exports, government spending, private and public investment, religious tourism, labour and capital as independent variables, while economic growth is addressed as the dependent variable. Empirical results show that all variables are important in the growth of the Saudi economy except non-oil exports, which do not have a significant effect on economic growth. Religious tourism's role was not found to be significant in the process of economic growth, when the economy as a whole was taken into consideration. Nonetheless, when isolating the non-oil sectors, the effect of religious tourism had a greater influence on economic growth. Concrete evidence also exists as to the importance of the role of an additional variable - government spending — in enhancing economic growth. Abstract: In recent years, numerous empirical studies have estimated the role of exchange-rate uncertainty on different countries’ industry-level trade flows. These have tended to find mixed results, with the majority of industries registering no impact, and the rest split between positive and negative effects. This study extends the literature to the case of US-Italian trade, for 145 export industries and 125 import industries. Of those industries, most exhibit significant short-run responses to exchange-rate volatility, but fewer register significant long-run effects. US exports of food and imports of raw materials appear to be particularly affected by risk in the long run, while many manufactures are not. Abstract: Value Added Tax (VAT) standard rate Laffer curves are estimated for the European Union of twenty seven countries (EU27) over the period 1995-2011, using a twice continuously differentiable VAT revenue quadratic flexible functional form. A business cycle effect on the Laffer curve is found. In recession years, VAT revenue is typically lower, the curve steeper, and the VAT standard rate that maximises VAT revenue slightly smaller than previously. These results can be explained with reference to changes in the composition of consumption and VAT collection enforcement. A countercyclical VAT standard rate policy (procyclical fiscal policy), observable in a few countries, not only increases the underlying business cycle volatility but may also result in long-term instability of VAT revenue. In 2011, the maximum VAT standard rates in expansion and recession were respectively 22.0 and 21.5 per cent. Most of the EU27 countries were operating in the non-prohibitive range of the curve; although Portugal, with a VAT standard rate of 23 per cent, along with several other countries with similar rates, was already operating in the prohibitive range of the curve. VAT standard rate Laffer curves shifted to the left and maximum VAT standard rates declined during the analysed period. Abstract: Markets are reputed to be more flexible than other economic arrangements, although the meaning of flexibility remains vague. For orthodox economists, it has a narrow interpretation based on relative price movements within equilibrating markets, leading to allocative efficiency. For heterodox economists and other social scientists, it goes beyond market-clearing equilibrium to take in price setting, non-price adjustments and the institutional background. This paper examines the meaning of flexibility as applied to markets and evaluates the main alternative views. The orthodox approach, which informs most economic commentary, offers a deceptive story of a complete market system with rapid price changes. Actual economies are flexible, not through prices alone, but through various adjustment methods. Abstract: After the 2009 global recession, many papers identified a non-linear inverted Ushaped relationship between economic growth and sovereign debt. However, their results are mixed regarding the exact turning point. According to the traditional view, we assume debt-to-growth causality and show that the mixed results depend on the heterogeneity of the non-linear debt-growth relationship. In our sample of 27 countries over the period 1994-2010, countries with a higher Gini index, our measure of income inequality, show lower threshold points upon which further increases in debt reduce growth, but a higher sensitivity of growth to debt changes. Hence, the more even the income distribution, the more a country should be fiscally virtuous to avoid affecting growth. The implication is that policies promoting a more equal income distribution reduce (increase) economic growth in (not) highly indebted countries. © Economic Issues. This site was created and is maintained by Nottingham Trent University.